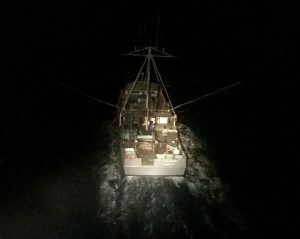 The captain of the 75-foot F/V LEANN reported that a crewmember fell and suffered a head injury while fishing more than 20 miles off Florence, Oregon. The call to the Coos Bay, Oregon Coast Guard came in just after midnight on December 15, 2016. The captain reported that the injured man was first knocked unconscious, but when he woke he was combative. 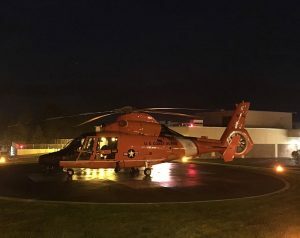 The Coast Guard flew a helicopter crew to the vessel, lowered a rescue swimmer to prepare for the lift, hoisted the injured man into the MH-65 Dolphin, and flew him to the Bay Area Hospital in Coos Bay, Oregon. Weather on scene was calm and clear with light winds.